The client is a growing Marketing Firm and they are currently doing weekly meetings in the company lunch room. They want to make a more robust meeting space as the growing staff requires them to keep the space open for other employees. The space for the new conference room is available in an unused private office suite, but it is very basic, with a table and a few chairs. There is a display on the conference table for each person in the meeting to share a screen at the meeting, but it is messy and they cant hear well. They also have a traveling sales director who comes into these meetings by cell phone and they want to have him more engaged in the meetings. In addition they are starting to bring more potential customer in and they want to create a more impactful experience when sharing presentations with the potential clients. They have enlisted you to design and implement technology to make this conference room effective, presentable, and integrated. They do not want to have to use a control system or special remote. They want an engaging experience for prospective clients to be "Wowed" by them. Do this all without a control system. This system works because it gives the customer the ability to quickly and easily put any PC up on a single display. While the function of switching laptops is manual (swap which source is plugged in). It is still a clean, robust and simple way for the client share multiple devices. They can additionally change the display to input # 2 to show the dedicated desktop PC for Skype on the main screen. The audio is routed through the display and out through a soundbar for a clean "control free" system. This system works because it gives the customer ultimate flexibility and experience. In this system each of the 3 displays can show a source using the 3 Wall Plates. Additionally they retain the ability to show the dedicated Skype PC, but it can be shown on any of the 3 displays. The displays correspond to the seating position in the conference room (Left, Cente, Right) so it is simple to know who is presenting what. The is broken out to a simly 2CH audio amplifier that powers 2 speakers, these speakers can be switched to output audio from any of the connected laptops or the Skype PC. Additionally if they want to hear multiple audio streams, they can play one through the connected display and the speakers at the same time, i.e - They can hear the connected person on Skype, and still hear audio from a presentation as well. 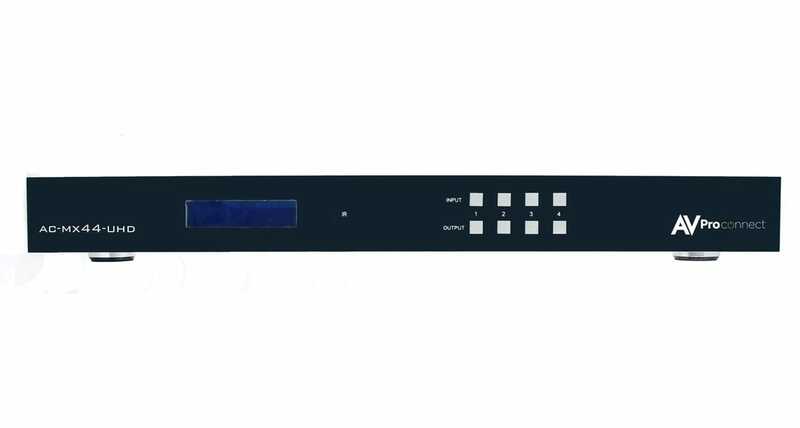 In thsi systen you have left them the option to implement a AVProEdge Matrix Switch so they can choose what is on each display in a matrix fasion, which can include a control system at a later date. This allows the customer to have a clean and simple input solution. This is ran using CAT cable to the displays. It universally supports standard, VESA, and HDR inputs along with VGA. Single CAT makes it simple to run over one wire thats easy to pull. This unit is used to split the signal from the Skype PC in the "advanced system" to all 3 displays. These are used to extract 2CH audio from the sources to go into the audio amplifier. This is only used in "Advanced Solution"
Want to take this system to the next level? 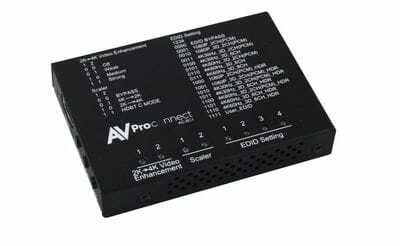 Add an AVProEdge Matrix to allow the user to switch any source to any display. This aloows you customer to have even more control over the conference room. 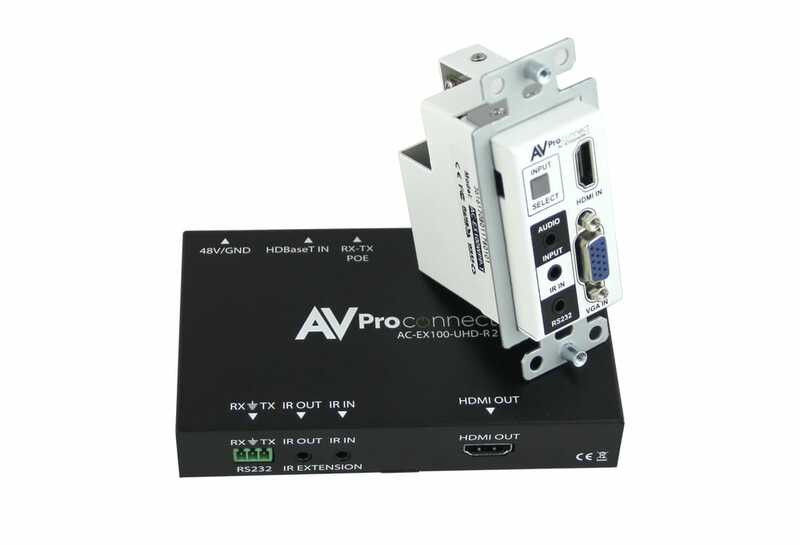 You can implement control using any one of our drivers, or allowing manual or IR control.